Physics is a fascinating science. It deals with times that range from less than 10-20 s (the half-life of helium 5) to 1.5 x1013 years (the probable 'age' of our Universe). Physicists study temperatures from within a millionth of a degree above absolute zero to almost 200 million degrees, the temperature in the plasma in a fusion reactor. An investigation of the mass of a quantum of FM radio radiation (2.3x10-42 kg) and the 'size' of a proton (about 1.3x10-15 m) all fall within the World of Physics! It is vital to realise that all the quantities mentioned above contain a number and then a unit of measurement. Without one or other the measurement would be meaningless. Imagine saying that the world record for the long jump was 8.95 (missing out the metres) or that the mass of an apple was kilograms (missing out the 0.30)! All units used in Physics are based on the International System (SI) of units which is based on the following seven base units. The kilogram (kg): this is the mass equal to that of the international prototype kilogram kept at the Bureau International des Poids et Mesures at Sevres, France. The metre (m): this is the distance travelled by electromagnetic waves in free space in 1/299 792 458 s.
The second: this is the duration of 9 192 631 770 periods of the radiation corresponding to the transition between two hyperfine levels of the ground state of caesium 137 atom. 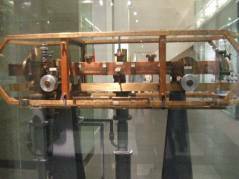 The phtograph shows a caesium atomic clock in the Science Museum, London. Electric current - measured in amperes. The ampere: this is that constant current which, if maintained in two parallel straight conductors of infinite length and of negligible circular cross section placed 1 metre apart in a vacuum would produce a force between them of 2 x 10-7 N.
The Kelvin: this is 1/273.16 of the thermodynamic temperature of the triple point of water. The mole: this is the amount of substance of a system that contains as any elementary particles as there are in 0.012 kg of carbon-12. It is most important to realise that these units are for separate measurements – you can't add together quantities with different units. For example five kilograms plus twenty-five metres has no meaning. It is rather similar to having a field in which there are 30 sheep, twelve cows and 25 pigs and asking how many there are? How many of what? It's simply a collection of different animals - you cannot add them together! We can use the base units to check that an equation representing physical quantities is correct. Remember the example of the cows sheep and pigs. Starting with ten sheep in one pen three pigs in a second pen and five cows in the third will still gives us a mixture of sheep, pigs and cows if we let them all join in one pen. It is the same with equations. The 'power' of mass, length and time on one side of the equation must balance their 'power' on the other. ms-1 x ms-1 = ms-1 x ms-1 + ms-2 x m the term m2 appears in all terms on both sides of the equation as does the term s2, the equation balances and is therefore probably correct. It is! (Notice that the number two is ignored, it has no units). In Physics we often deal with very small or very large numbers and it is important to understand how these may be represented. It is important to understand how to use your own calculator; they can all be slightly different. This is especially true when dealing with powers of ten. Remember that 5.4x104 is keyed in as 5.4 EXP 4 but that 105 (One followed by FIVE noughts) is keyed in as 1 EXP 5 and NOT 10 EXP 5.